Aloe Vera powder and concentrated gel, are used in the cosmetics industry where it act as an anti-inflammatory, soothing agent and deep moisturizer. Its pH is low, its non toxic, doesn't produce allergies and because of its vitamin, mineral and amino acids contents, it provides great benefits in health, skin and hair care. When it´s used in the recommended percentages in formulas, best results are guaranteed. To keep the original properties of Aloe Vera gel and obtain their maximum benefit as a cosmetic component, it is essential to subject it to as few chemical and physical processes as possible, because the excessive chemical or enzymatic modifications, oxidation or reduction, alters the chemical structure of Aloe Vera gel. Levels the pH, reduces stomach acidity and promotes gastrointestinal bacteria balance. It has rejuvenating properties, possess great ability to increase production of fibroblastic skin cells, which are responsible for collagen formation. Its enzymatic capability, facilitate the full nutrients digestion, preventing the formation of undigested substances, responsible for the antigen-antibody reaction, very common in most rheumatic and arthritic processes. Acetylsalicylic acid content in this plant, greatly contributes to reduce pain and swelling involved in these processes. It is an excellent anti -inflammatory, antitoxin, antiviral and analgesic. It has a bronchodilator effect and helps to quickly relieve the asthma symptoms. It is also immune-modulating and anti-inflammatory and therefore reduces the symptoms of allergic asthma. It's a very effective solution against hair loss, due to its composition similar to keratin, its amino acid complexes are identical to those of the hair follicle. It exerts a bactericidal and fungicidal action which removes dandruff, while Its enzymatic action drags dead cells off the scalp. Aloin re-vitalizes hair making it more flexible, gleaming, docile and resilient. Allows faster healing (up to 50% faster)without any keloid, rebuilds tissue and allows oxygen to reach the wound. Its contents in calcium, potassium and cellulose makes aloe build a network of fibers in the injuries to secure the blood platelets, helping to clot and heal. Regularly consumed as juice it may reduce cholesterol levels because it contains ingredients that emulsify and facilitate cholesterol's removal from the body. 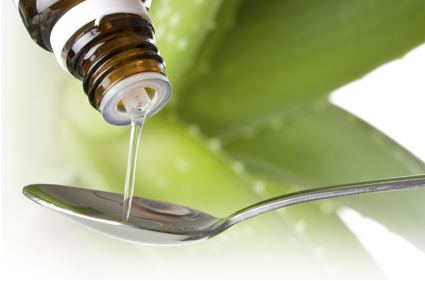 Aloe has a bactericide action on dental plaque, allowing a thorough teeth cleaning. It works effectively against teeth and gum ache, neuralgia, thrush, laryngitis, dysphonia, tonsilitis, plaque and any oropharyngeal condition. It is rich in enzymes, rehydrates and regenerates the digestive system, neutralizes pH and stimulates bacterial flora, improves nutrients absorption and waste destruction. Eliminates flatulence produced by stomach waste. Reduces the effects of allergies, indigestion, burning indigestion, gastritis, stomach and duodenal ulcers, eye ulcers, hemorrhoids, and digestive apparatus condition. Relieves stomach, small intestine, liver, kidneys and pancreas congestion. It is a natural laxative, facilitates bowel movements in people with constipation problems. It has a sedative effect due to its contents of natural painkillers. Because of its anti-inflammatory properties and its ability to deeply penetrate the skin, it eases pain caused by blows, sprains, dislocations, arthritic, rheumatic and muscle pains, and tired feet. Thanks to its ability to drive nutrients and moisturize all of the skin layers, it facilitates absorption and prevents skin water loss. According to some researchers, frequent Aloe Vera consumption, normalizes blood pressure in a few weeks. Aloe eliminates the accumulation of melanin that causes brown spots on the skin, in both, elderly and young people who have been over exposed to sun radiation. Increases up to 8 times the production of natural collagen-responsible cells, thus favoring the cell regeneration, which makes Aloe suitable for applications in the treatment of: acne, psoriasis, dermatitis, cellulite, eczemas, hemorrhoids, wrinkles, warts, athlete's foot, bites of insects, spiders, jellyfish, and poisonous plants . Contributes to smooth out wrinkles. Removes pore infection caused by juvenile acne. It destroys dead cells, allowing their disposal, and regulates pH within the three skin layers (epidermis, dermis and hypodermis). Prevents abdomen and breasts striae or streaks. Regenerates skin cells after shaving. Prevents redness, rashes, graininess and pimples, and quickly closes the pores after depilation. It turns out very suitable in varicose veins treatment, eases the pain and helps healing. It has also been found useful in cellulite treatment. Absorbs and reduces body odor, thus it is an excellent deodorant. Builds a sunscreen against UV radiation. It can be used as a shield against sunburn, even once produced. The combined use of Aloe lotions and consumption of Aloe juice or capsules along with a healthy, balanced diet, has succeeded in controlling psoriasis. Aloe vera contributes with three factors acting together in burns relief. Acetylsalicylic acid combined with the magnesium contents in the plant produces an anesthetic effect in the area damaged by burns. Aloe covers a broad antimicrobial spectrum, which promotes burn asepsis and prevents infection. Accelerates healing of burns, stimulating growth of healthy skin cells, produces a rapid regeneration by causing new skin cells close around the affected area without causing scab or scar. Aloe acts on the prostaglandin mechanism, through which the cell maintains its integrity. The juice of the aloe plant brings plenty of nutrients when the aloin is completely eliminated, in a proper industrial process. Aloe contains only 8 calories per every 28 grams of juice, so it is recommended for people who follow a diet to lose weight. Aloe creams are very popular among athletes. When combined with aspirin to treat pain and related peripheral extravasations, related to sprains and strains. The analgesic and anti-inflammatory effects of aspirin and aloe combine to produce rapid and effective results. It is used to treat gingivitis, mouth ulcers, blisters, and herpes simplex. It reduces pain, bleeding and inflammation, while it is bactericidal, antiviral and antifungal. It is used to fight plaque because it inhibits the growth of bacteria responsible for it.